Our gold standard. Spot + stain, carpet + upholstery. For newer-looking carpets. 30 seconds amazing stain removal action and odour elimination red wine, tea, coffee, soil, Pet urine. 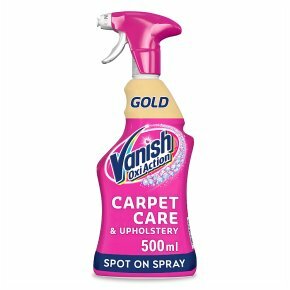 UK's #1 stain remover, Vanish Oxi Action Pre-Treat Fabric Stain Remover Spray provides super boosted 30 seconds* results with some stains removed in just 30 seconds. Instant action on stains 1st time* For best results treat the stains as soon as possible, apply on both sides and *follow instructions on bottle. Spot + stain - Carpet, upholstery How to Use - Open, remove dirt, spray max 5 min and blot Usage Advice For best results treat stain immediately. Safe for use on wool carpets. Always test a hidden area for colour fastness. If carpet colour is affected do not use this product. Remove loose dirt and blot wet stains with a clean absorbent cloth. DO NOT USE on "velvet" materials, brocade, or those unsuitable for wet cleaning. Not suitable for silk and oriental rugs.<br><br>Safety Information<br>Keep out of the reach of children and pets.<br>Do not get in eyes. If product gets in to eyes, rinse with plenty of water.<br>Do not ingest. If swallowed get medical attention.<br>Do not breath spray.<br>Wash hands after use.<br>For sensitive skin, the use of gloves is recommended.<br>Do not mix with other products.